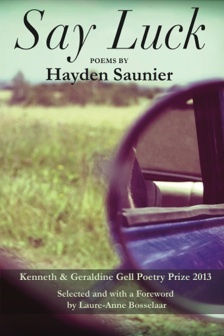 Of the many complements I could pay to Hayden Saunier’s second poetry collection, Say Luck, the one that comes to mind first is that it’s fun. While there are poems of grief, doubt and anguish, those are balanced with poems of wit and awareness that ring out with gratitude for life. This ultimately is what makes the collection feel authentic and trustworthy. It’s so seldom that one can say that about a book of poems these days. I’d say luck has entered your life more than once. In passages like the one above, and many others, you see her talent for loaded lines—words and phrases casting two shadows. She moves into those lines easily, and they appear on your horizon like the crest of a hill you’ve been driving toward but didn’t know you’d reached. “The view from here / will always be the view from here, no matter / who is witness.” she writes in a poem about dealing with someone’s death. By the end of the book, if you’ve read the poems in order, you feel as if you’ve been walked through a life, maybe as a bird sitting on the author’s shoulder, and been invited to share snippets of experience, ordinary moments and epiphanies drawn from them. She observes, catalogs, recollects, questions and offers insights, as good poets do, asking us to pay similar attention to our own surroundings. You can find Say Luck here at Amazon. 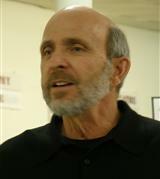 Two wonderful poems from my friend Tom Mallouck.